If you've recently found yourself in possession of a new smartphone or tablet, we recommend giving the Poptropica app a whirl! It's a free download, with a mix of new and classic Islands for you to enjoy. On your Android device, download from Google Play! On your iOS device, download from the iTunes Store! You can look forward to lots more mobile fun from Poptropica in the coming year! And, of course, creating tons of new Islands! Don't forget that you can play our latest, Arabian Nights: Lair of Thieves right now with Membership! Of course, we've got many more big plans for 2015 and beyond. We can't say it enough: the players are the essence of Poptropica. We may not get everything right, but we'll never stop trying to make the very best game we can for you! Have a happy new year, and we'll see you in 2015! Last chance to get your Poptropica t-shirt by Christmas! This is it. Today is the last day to order a customized Poptropica shirt and get it by Christmas! Just select two-day shipping at checkout to receive yours by December 24. Visit the Poptropica Shop now to get started! The monster costume pictured above can be yours for free! Just visit Super Villain Island and complete the mini-quest on Main Street. Then, you too can look like a dashing, three-eyed monster! Feeling lonely? No more! Head to Main Street of Night Watch Island and watch the video to get your very own caveman follower. Visit Poptropica now to get yours! Heads up, fashion bugs. If you want to get a customized Poptropica shirt for yourself or as a gift, time's running out to get it by Christmas! 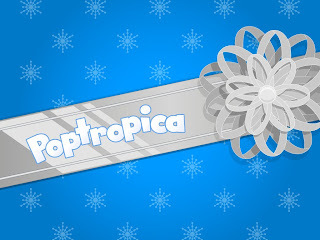 Take a look in the Poptropica Shop now to find that perfect holiday gift! Early Access to Arabian Nights: Lair of Thieves is now available! Poptropica Members can now play the second episode of Arabian Nights, Lair of Thieves! Visit Poptropica now to play. That's not all. We've also released two new Arabian Nights items to the Poptropica Store, also exclusively for Members. Get your Sword and Scimitar items with Membership, and then take on the Lair of Thieves! Once you've finished the adventure, see where you rank on our World Champions Live Map. It's updated automatically as players earn their Island Medallions. Enter the thieves' lair... if you dare! Remember, our last new adventure of 2014 will be released to Poptropica Members this Thursday, December 11. This one has it all: danger, comedy, and twists you'll never see coming. If you're not yet a Member, get Membership today so you can play Arabian Nights: Lair of Thieves tomorrow! Here's a holiday gift for you: Galactic Hot Dogs Island is coming to Poptropica in 2015! You can learn more on our Galactic Hot Dogs Island info page. Keep watching this blog for more news about Galactic Hot Dogs Island! Arabian Nights Plundered Armor outfit now available! Just in time for the release of Arabian Nights: Lair of Thieves this Thursday, we've added a brand-new costume to the Poptropica Store. This set of Plundered Armor from the lair of the 40 thieves is just what you need to tackle the most dangerous Poptropica adventure yet. The Plundered Armor outfit is available exclusively for Poptropica Members -- so become a Member today to get yours. Then get ready to descend into the Lair of Thieves this Thursday! We've just updated the Poptropica app on iOS so that the final chapter of Mission Atlantis, Out of the Blue, is available for free! If you've been holding off on discovering the secret at the bottom of the ocean, now's your chance. Download or update the Poptropica app from the iTunes Store now to play! When can you play Arabian Nights: Lair of Thieves? We're happy to tell you that Early Access to Lair of Thieves, the second episode of Arabian Nights, will be available to Poptropica Members next Thursday, December 11. Oh sure, it sounds like good news, but just wait until you find out what awaits you in the lair of thieves! If you're looking to fill out your holiday wish list, don't forget about Poptropica: Forgotten Islands for the Nintendo 3DS. It's got all the quests, costumes, and adventures of the iOS game, and is presented in eye-popping 3D! Time's running out, so check out Poptropica: Forgotten Islands at Amazon and other fine retailers. The new and improved Shrink Ray Island will be available for everyone to play this Thursday, December 4. We'll let you know the moment it becomes available! If you want to get your adventures with Jorge and Oliver on the go, we've got the app for you: new in the iTunes Store is the Poptropica Comics app. It's a free download! Just a quick note before we head out for a long holiday weekend. Here in the States, we take this weekend to reflect on everything we're thankful for, and for the Poptropica Creators, that means YOU! We've had a great year, releasing an app on iOS and Android, and telling some of the best stories we've ever told. But it wouldn't mean anything if not for the Poptropicans who play the game, who write fan blogs, who share their feedback with us, and who spread the word among their friends. Thanks very much for playing Poptropica. You are the ones who make Poptropica what it is! It's that time of year again! If you're hankering for some Poptropica goodies this holiday season, we've got you covered with our handy dandy holiday wish list. Print out and complete your Poptropica wish list so that the gift givers in your life will know what Poptropica gear you've already got, and what you can't live without! Are you a Shrink Ray World Champion? Poptropica Members are making their way through the new and improved Shrink Ray Island, and their achievements are being recorded on our Shrink Ray Island World Champions live map. Are you one of them? Don't miss your shot at Poptropica immortality. Become a Member today so you can take your place among the World Champions of Shrink Ray Island! Two more Poptropica comic strips to close out the initial run. That does it for now, but Oliver and Jorge will return for more Poptropica adventures in 2015! Until then, you can read a whole bunch of daily comic strips, including PEANUTS, by visiting Poptropica and checking out the Daily Pop. Boys, if you want to get your hands on a flying remote control car, now's your chance. Visit Main Street of any Island to get your hot new toy! Girls, want to get your hands on this creepy cool dress? Visit any Island for your monstrous makeover. Early Access to the improved Shrink Ray Island is now available! Shrink Ray Island just got bigger. Poptropica Members can now play the new and improved version of Shrink Ray Island, with a bigger screen and a full soundtrack! Become a Member now to play the bigger, better Shrink Ray Island on Poptropica! Poptropica is now available on Google Play! It's a bold new frontier for Poptropica. The Poptropica app is now available as a free download from Google Play! Now, you can play Poptropica on your Android device -- it works on thousands of phones and tablets! Download and enjoy classic Poptropica quests like 24 Carrot Island and Mythology Island, and new adventures like Survival and Mission Atlantis. Don't delay: download the Poptropica app for Android today! We're working hard on a bigger, better version of Poptropica Land that we'll be releasing to everybody in the early part of 2015. But Poptropica Members are still building astounding creations in the Poptropica Land alpha version. Here are a few great ones that have come along recently. Creepy Singer made a spectacular brick abode. Golden Leaf gave us this floating domicile. Prickly Monster made, well, a prickly monster! Quick Tomato is the lord of this manor. Great stuff! If you want to keep building new lands and sharing them with us, become a Poptropica Member today!